Boil the potatoes in their skins, when cooked drain and let cool. Once cooled, peel them and cut them into slices. Chop a clove of garlic and let it brown slightly in a large pan with a little oil, add the beets after peeled, add salt, add a cup of water, cover and leave to simmer for about 15 minutes, stirring occasionally and making sure that doesn't stick to the bottom of the pan: if necessary add a few tablespoons of water as it dries. Chop the shallot and another clove of garlic, fry briefly in a couple of tablespoons of olive oil, add the tomatoes, cut into wedges, season with salt and add a pinch of red pepper. Sauté them causing them to wilt and leaving evaporate their water. 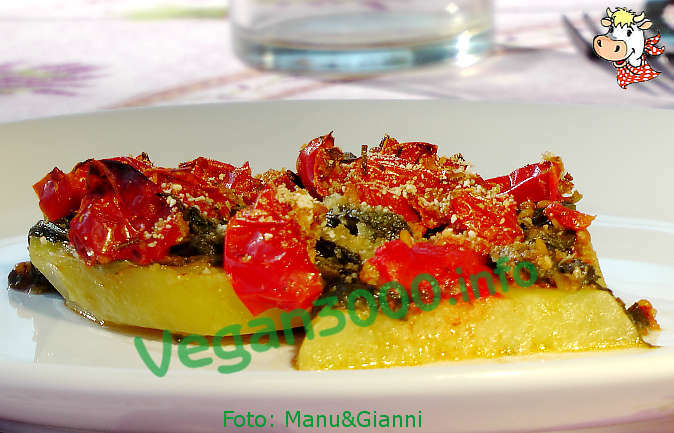 When all vegetables separately are ready, grease a baking sheet with a thin layer of oil and clutch springs in this way: on the bottom you have boiled potatoes sliced, then follow with a layer of biete and finish with the tomatoes. Sprinkle the surface with a light dusting of bread crumbs and nutritional yeast flakes, then bake in a hot oven at 200° C for 15-20 minutes and serve.